When you first arrive at Port Orleans Riverside or French Quarter you’ll need to go to your resort’s Front Desk in the main lobby and give them the booking confirmation details for registration. Officially, rooms are not available until 3pm but the resorts operate a “Ready Room” system and sometimes you may find that a room may be available earlier — it can’t hurt to ask. As a word of warning though, at peak times — and especially at Riverside — this area can get very busy so be prepared for a wait. At check in you will receive a welcome pack containing your Magic Band(s), a resort information sheet, maps, park hours, details of current promotions, car parking pass, etc. If you want to do some planning before you arrive, recent copies of many of these items — including the Sassagoula Times information sheet — can be found on our Document Downloads page. At busy times, guests using any of the Disney Disney Plans can pick up their free Rapid Fill refillable mugs from the lobby when they check in, thus avoiding possibly lengthy queues in the food court before getting a first drink. If your room is not yet ready when you arrive, simply complete all the paperwork and leave your bags with Bell Services and head off to enjoy the parks or the resort facilities in the meantime. You will be given a welcome pack and your fully operational Magic Band at this time, but you will not be advised of your actual room number as yet. At the specified time you may either phone the resort or return to the Front Desk in person and they will then advise you of your room number. Alternatively, if you leave a mobile phone number they can send you an SMS text message when your room is ready. Once you get to your room, give Bell Services a call and they will deliver your bags. Note: Rooms will be held until 6am the following morning as long as a deposit payment has been made. A new online checkin facility was launched on 26 February 2009, allowing resort guests to pre-register for their stay via Disney’s website — now up to 60 days in advance of arrival date. The system allows you to provide such information as full guest names, arrival & departure times, on-site (e.g. cell phone) contact details, a credit card number for room-charges and also any special room requests (although, as always, these cannot be guaranteed). Magic Bands can also be customised by colour and a name added for each party member, and USA-based guests will receive their Magic Bands by post a few weeks before their arrival date. A welcome pack, which will include your Magic Bands if they have not been posted, will be waiting at a quick-pickup location located in the resort lobby. For more details, or to use the service, log in to the special My Disney Experience page at www.mydisneyexperience.com. Checkout time is 11am. Again, Bell Services can collect your bags from your room and store them until you are ready to leave which allows you to spend the rest of the day at the parks if you wish. Express Checkout is available if you have already registered your credit card at the front desk, in which case an itemised bill will be left at your room by 8am on your departure day. It may be possible to extend until your checkout time until 1pm without any extra charge, but this is subject to limited availability — ask at the Front Desk earlier in your stay to see if this option is available. If you need to stay later than 1pm, there will be a charge of 50% of the daily rate. If you plan to hang around the resort for a while after you’ve checked out — for example if you are taking an afternoon flight — do remember that you still have access to all of the resort facilities. This includes use of the swimming pools, and there are free towels and changing facilities provided at both of the feature pools. 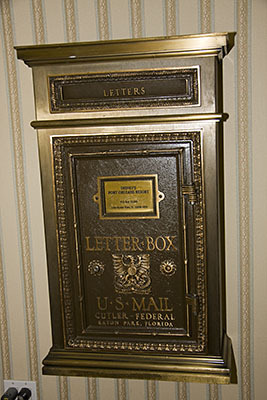 There are mailboxes located at both front desks and in the shops for sending mail, and you can purchase stamps from the gift shop. The shops have scales to weigh heavier items. If the package is for a guest not listed on the reservation, use the name of the primary guest on the reservation, but always make sure to include the world GUEST and the arrival date if not yet at the resort. Don’t quote the booking reservation number, but if you already know the room number you can include that. 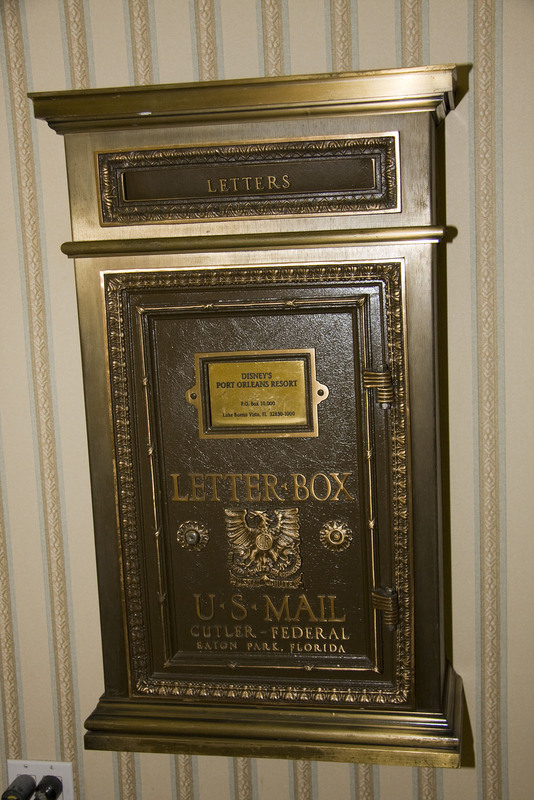 There is now a $5 per item charge for handling any mail or packages delivered for for hotel guests via post or courier, including Amazon Prime Pantry. The fee for food/grocery orders — for example Garden Grocer or Amazon Prime Now — is now $6 per order (not per bag or box) which includes delivery directly to the guest’s room by Bell Services. If a package arrives before a guest has checked in, the item will be held in storage for them. You will get a call or message from the Front Desk to notify you if a package arrives during your stay. Do make sure you work your timings out so the package arrives in good time though — you don’t want to miss it, but equally it’s best not to have it delivered too far ahead of your arrival date, especially for perishable orders. Any packages delivered after you have departed will be automatically returned to sender. Please advise if a food delivery will need to be kept refrigerated, and Bell Services can arrange this for you. The resort asks that water deliveries be kept to a maximum of one pack per outer cardboard box, as Wal-Mart and some other companies have started boxing two large packs of water in a single outer carton, and these heavy items are causing handling issues. Although there are no business bureau or computer rental facilities at either of the Port Orleans resorts, the Front Desk can send and receive faxes for you at a charge. Port Orleans French Quarter also has a small conference room available for hire. The Front Desk can also supply items such as electrical adapter plugs/etc, and other essentials can be purchased from the resort gift shops. There is a Fuel Rod purchase/refresh station located in both lobbies. For a one-off fee of $30 you can buy a portable phone charging system which gives you a fully charged portable battery, plus short cables for Micro-USB, Apple 30-pin, and Apple Lightning devices. When your battery pack runs low you can swap it (as often as you like) for a fully charged replacement at any similar kiosk around Walt Disney World, and at other compatible locations. ATM machines (cash dispensers) are located in the main lobby area at Riverside and beside the Front Desk at French Quarter, next to the Arcade entrance. Note: As with all such machines in Walt Disney World, there is a charge of roughly $2 per transaction for withdrawing cash. A concierge (Guest Services) desk is located in each lobby area from which you can get general information, purchase park and other tickets, make dining reservations, etc. Their hours are normally 8am to 8pm, but you can also ask at the main Front Desk when they are closed. Pay phones used to be located near to the Front Desks in both lobbies and in the food courts, but these have been gradually removed as mobile phones have become more commonplace. Daily housekeeping (often referred to by guests as “MouseKeeping”) is now an optional service. Normally your room will be serviced, beds made, trash removed, and surfaces/etc cleaned daily, however at check-in you can now request a $10 per night credit instead of daily housekeeping. This will be provided in the form of a Disney Gift Card rather than an actual discount, and it is an all-or-nothing arrangement for which you will be credited for every night except the final one of your stay. If you do decide to opt out, housekeeping will leave you a care package of toiletries (unless your room has wall-mounted dispensers) and fresh towels as needed. The Port Orleans resorts do not provide full room service facilities but pizza delivery is available to all guest rooms and poolside from 4pm to midnight. Phone 1-407-934-5787 or use the button on your room phone. See Sassagoula Pizza Express Delivery Service page for menu options and prices. Complimentary wireless internet access is now available in all guest rooms, plus in the main public areas — lobby, restaurants, areas surrounding the feature swimming pools, bus stops and Porte-Cochère. Ice machines are located on each floor of every accommodation building. At French Quarter these are located next to the elevators, and in the Riverside Alligator Bayou section they are located at the junction between the two halves of each Lodge. The Riverside Magnolia Bend mansion buildings have several locations within the central sections of the buildings. Ice buckets are provided in your room. Snack, drink & confectionery vending machines are located next to the ice machines, and also in each of the poolside guest laundry rooms. An in-room baby-sitting service is bookable, contact the Front Desk for information. Disney generally recommends using Kids Night Out, but there is also the Fairy Godmother service. Both companies charge by the hour with a minimum of four hours, and Kids Night Out in particular allow you to specify your detailed requirements — even down to the age range and gender of the sitter. The sitters will bring along age-appropriate toys and can look after your children either in the room or take them out to the food court for meals, and then put them to bed if required. Note: sitters are not allowed to take children swimming or bath them for legal reasons. Effective for reservations made from 21 March 2018 onward, overnight car parking will no longer be the inclusive perk that it has been for resort guests at Walt Disney World for more than forty-five years. Self-parking at Port Orleans will now incur a nightly fee of $19 per car, which will be applied to your hotel folio upon check-out. Note: This does not currently apply to guests with UK-made bookings, for whom parking will remain free until 2020 (presumably this was due to wording already printed in UK travel brochures). Theme park parking will remain “complimentary” (or at least included) for all resort guests, and self-parking at the water parks, Disney Springs and the ESPN Wide World of Sports remains free for everyone. Short-term complimentary self-parking is also available for day guests and visitors who want to visit any of the Disney Resort hotels to experience the dining, shopping, entertainment, and recreation offerings. Washing machines and dryers are located in laundry rooms near to each of the quiet/leisure pools at Riverside and also behind Mardi Grogs (near to the Doubloon Lagoon pool) at French Quarter. Washing costs $3.00 per load, payable only via credit card (the price was increased from $2.00 to $2.50 on 28 April 2015, and then to $3.00 sometime around the start of 2016). Individual portions of various detergents/etc — currently Tide, Clorox, Ultra-Downy and Bounce — are available for a further $1 if you haven’t brought your own. The dryers now also cost $3.00 per hour. The French Quarter laundry room has 16 washers and 24 dryers, each of the three Alligator Bayou rooms have 8 washers and 12 dryers, and the two Magnolia Bends rooms have 10 washers and 16 dryers each. 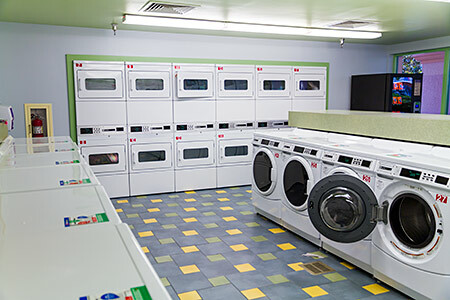 The location of these laundry facilities is very convenient as you can set a machine load going and then take a relaxing dip in the pool while you’re waiting for it to finish. The machines are available 24 hours, but if you’re a night-owl and plan to use the laundry rooms after midnight you’ll need to take your Magic Band to gain access. Following a successful trial period at French Quarter, as from April 2015 all of the Port Orleans laundry machines now feature cashless terminals which are only able to accept card payments. As Disney is using an off-the-shelf payment processing solution, there is no facility for guests to pay using Magic Bands or even old-style Disney Key to the World cards. However, since no ZIP code or PIN entry is required, most credit, debit or pre-loaded dollar payment cards should work - including internationally issued cards - just as long as there is a magnetic stripe on the back. It is also possible to purchase a pre-paid laundry card for $7 from the hotel Front Desk. The new machines are now also internet connected. Yes, really! You can check on the current status of any of the washers and driers at Port Orleans via the website www.laundryview.com/disneyworld/ using either a computer or a mobile device, which allows you check for available machines and also to see when your own load is finished. There is also a valet laundry service available for which there should be a large laundry bag in your room. Place your items in the bag and fill out the form, and as long as they are in by 8:30am, your cleaned items should be returned by 6:30pm. For Same Day Express Service add $30, and for Overnight Service add $45 (contact Housekeeping for details). Also contact Housekeeping for additional services such as Alterations, Wedding Gown Cleaning, Shoe Repair, or Leather Cleaning. It might be worth checking the rather expensive price list before you plan to use this facility though! There is a separate section on this site for recreation facilities.